I hope you won't harbor any ill will toward me when I say that our selection of stuffed harbor seals and plush harbor seals is the best on the internet. As you may know, a plush harbor seal can also be called a common seal but I assure you that there is nothing common about these adorable stuffed harbor seals. No matter which plush harbor seal you choose you are sure to get an exceptionally crafted and delightfully charming stuffed animal. Just like real harbor seals, our stuffed harbor seals come in various colors, ranging from light gray to brown, and also are available in several different sizes. 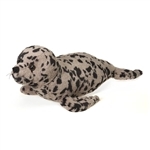 We understand that choosing a plush harbor seal is serious business so we will be glad to assist you in any way we can. Just give us a call if you need any help sealing the deal!